Tucked away in some of Mom’s old cookbooks that she passed on to me when I moved into my first apartment were some of her old, hand-written recipes. This one was grease stained (from butter and cheese, I’m sure) and finally tore. My Mom said that as a young newlywed in the late 1960s, a friend in Alabama shared this recipe with my Mom. This is the only type of fudge I ever make, and I do not normally tell people what is in it, because they don’t always ask! People ooh and aahh over this, and just beg for more. If you ask, I will tell you. If you don’t ask, I won’t tell. 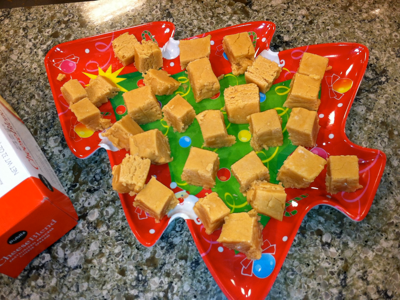 If you have had this fudge, then you know it is so delicious. If you have never tasted this or prepared it yourself, once you get over the initial shock of the ingredients, this becomes the most mouth-watering fudge you have ever tasted! **You can add flavorings of all types to this. A raspberry or orange flavoring is good. You can add chopped nuts, dried cranberries; you could substitute cream cheese for the Velveeta which I did once (only because I did not have enough cheese left). In a heavy saucepan, melt the cheese, butter and peanut butter together, stirring constantly (with a whisk) to keep it from scorching on the bottom of the pot. Remove from heat and add vanilla. (At this point, if you would like to add nuts, you could add 1 cup chopped walnuts or whatever nut you like). Set aside. In a large bowl, sift the powdered sugar and cocoa. To incorporate the cocoa into all of the sugar, I sift one box of powdered sugar, then the cocoa, then the second box of powdered sugar. Now pour the butter-cheese mixture into the sugar mixture and stir. I use a flat spatula/spoon to stir this. Now pour and press mixture into a square 9 inch pan. I blot the oil mixture that comes out on top, then leave it to set up. If you need to “hurry” this process, let it set up in the refrigerator. Cut into small bite-sized pieces because it is very rich! Follow the directions for the peanut butter fudge above, but omit peanut butter and sift ½ cup unsweetened cocoa with the powdered sugar.